My Throwback Thursday this week is two pictures of my son Ryan. 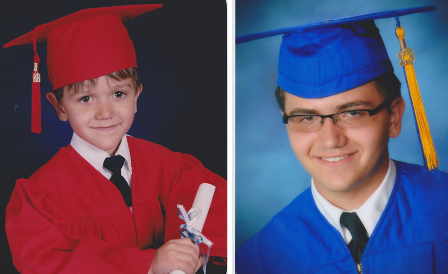 The one on your left is his Preschool Graduation photo and the one on your right is his High School Graduation photo. He graduates in less than a month and will be attending Texas State University, in the honors program, with a scholarship. I am one proud mom! Great photos and I believe I detect the voice of one proud momma. Congratulations! You should be a proud Mom and congratulations, Happy Mother's Day!